Clayton Kershaw leads the majors with a 0.65 WHIP. You probably could have guessed that since Kershaw is the best pitcher on the planet and leads the league in basically everything good. Can you guess who’s second, though? Jake Arrieta? Chris Sale? Noah Syndergaard? All good, strong, educated guesses. All wrong. The second-best WHIP in the majors belongs to Kyle Hendricks, who checks in at 0.94 walks and hits per inning in 68 1/3 innings. The 26-year-old also has a 2.90 ERA, 2.94 FIP, and 57 strikeouts against 15 non-intentional walks. Cubs starters lead the majors in ERA, FIP, xFIP and fWAR, the latter by an especially large margin. Hendricks is a huge reason why, and this is a rotation that has four of the top-20 fWAR pitchers (Arrieta, Hendricks, Jon Lester and John Lackey) so far this season. Hendricks’s owners know how good he is. He was a chic sleeper pick coming into the season, and has exceeded the lofty expectations of those who believed he could be a breakout performer this year. It’s not as though this came out of nowhere. Hendricks logged 260 1/3 innings in 2014 and ’15, and was sneakily effective. He posted a 3.49 ERA, 3.34 FIP, 1.13 WHIP and 214 strikeouts, all while being overshadowed by Arrieta and, last season, Lester. This season isn’t a true breakout as much as it is the continued maturation of a pitcher who already had a foundation for success following the trajectory set for himself in his first season-plus in the majors. It might seem that Hendricks would be hard to buy, and that could very well be true. The one thing he doesn’t do, however, is miss a ton of bats. He posted a 22.6% strikeout rate last year, but had just an 8.1% whiff rate. The latter is up to 8.6% this year, but the former has dipped to 20.7%. That’s what could make Hendricks more available that the average pitcher with a 2.84 ERA and 0.92 WHIP for the best team in baseball. And while his owner would be right to make you pay full price for the pitcher he has been over the first 10 weeks of the season, you would be wise to meet that if you are in the market for pitching. Hendricks knows exactly who he is, and he doesn’t try to run away from it. He’s not going to dazzle you with stuff or overpower you with heat. The average fastball on his sinker, his fastball of choice, is 87.7 mph. He still throws his cutter a fair amount, but that checks in at an average velocity of 88.5 mph. He barely throws a breaking ball, using his curve just 6.3% of the time this season. As always, he’s getting plenty of mileage out of one of the best changeups in baseball. According to Pitch F/X, Hendricks has saved 3.75 runs per 100 changeups this year, making it the fifth best in the league, behind Danny Salazar (5.9), Anibal Sanchez (4.54), Drew Pomeranz (4.52) and Kershaw (3.84). It’s no stretch to say that Hendricks has one of the best sinker-changeup combos in the majors. 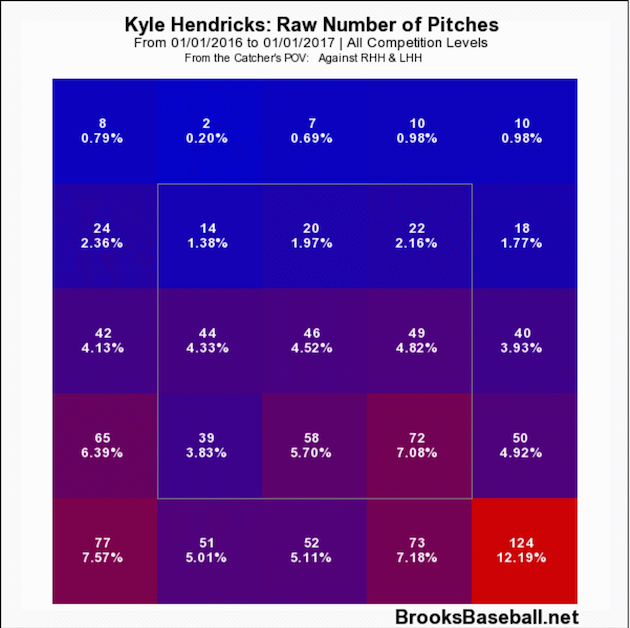 Every pitcher wants to get strike one and live down in the zone, but for someone with Hendricks’s repertoire, both are an absolute necessity. He’s accomplishing the first, getting ahead 0–1 against 70.3% of the batters he has faced this season, the third-highest rate in the majors. Syndergaard can not only get away with being up in the zone, he wants to attack high. That’s the luxury of having a fastball that sits 97–98 mph. The only way Hendricks’s sinker-change combo can be successful is if it is consistently in the zone low or dipping beneath it after starting at the knees. I’ll point out what the following zone profile screams loudly: Hendricks’s command and control this season has been a thing of beauty. With all those sinkers and changeups at the bottom of the zone, it shouldn’t surprise you to learn that Hendricks has the second-highest soft-hit rate in the majors (29.2%) and fourth-lowest hard-hit rate (22.5%). Here’s Hendricks at his best, in a strikeout of Cameron Rupp two Saturdays ago. It was the second complete game of his career. We’ll start with the 0–1 pitch—of course it was 0–1—a sinker. On 1–2, he’s going to the changeup. It takes supreme confidence in a change to throw it to a same-sider. Hendricks has that in his change, and you can see why. Hendricks may not rack up gaudy strikeout numbers, but his fantasy owners can live with him around a 20% K rate and 7.5 K/9 if he’s spotting his pitches with the precision he has to this point of the season. His average strikeout upside could make him available, and that’s something to exploit in the trade market. You should only be considering this move if you can get Upton at a major discount. There’s no way to spin Upton’s first season with the Tigers as anything other than terrible. While you could point to a number of metrics that encapsulate how mightily he has struggled at the plate this year, the one that most stands out is his 35.2% strikeout rate. Upton has always had his fair share of whiffs, but before this season his highest strikeout rate for a year was 29%. There’s really nothing to go on here, beyond his track record and the simple fact that players just don’t suddenly fall off a cliff in their age-28 seasons very regularly. Upton has eight hits, including two doubles and a homer, in his last five games. It’s not much, but it’s about the best run he has had this season. The Yankees are 28–30 and 6 1/2 games out of first in the AL East. The makeup of their roster, as well as their competition in both the division and the AL at large, suggest that they will only fall further out of the race without a dramatic, and unlikely, turnaround. Meanwhile, Miller is one of the best relievers in baseball, and an absolute terror against lefties. Miller has a 1.05 ERA, 0.74 WHIP and 46 strikeouts in 25 2/3 innings. Lefties are 3 for 23 with 14 strikeouts against him, and all three hits are singles. The Yankees are one of the oldest teams in baseball, and Miller will be one of the most sought-after pitchers—starter or reliever—at the trade deadline. You can see where this is going. Miller’s plenty valuable enough to own as an elite setup man, but if he gets traded and closes for his new team, he’ll be one of the best fantasy relievers in the game. See if you can pry him from his owner with the trade deadline still seven weeks away. Over the last 30 days, Diaz is hitting .250/.287/.390 with a strikeout rate that’s more than four times his walk rate. Jhonny Peralta is back in the fold, and while he’s starting at third with Diaz and short and Matt Carpenter at second for the time being, Peralta could easily slide back over to his natural position if Diaz continues to struggle at the plate. The younger Diaz has better range than Peralta, but there’s no doubting who has the surer glove. Kolten Wong hit his way back to Triple A Memphis earlier this week, but let’s remember that Diaz played all of 14 games above the Double A level before starting the season with the Cardinals out of necessity, and that he hit just .264/.324/.421 at Double A last year. His eligibility at second and short, as well as his overall numbers, will still make him attractive on the open market, but there’s evidence that he’s a depreciating fantasy asset. Carpenter is the team’s best player, and Peralta is a strong veteran with a track record as a steady two-way shortstop. If Wong hits enough at Triple A to get back to the Cardinals, Diaz could lose some playing time. Fulmer’s success has not been a mirage. The 23-year-old, whom the Mets sent to Detroit as part of last year’s Yoenis Cespedes, has a 2.83 ERA, 1.18 WHIP and 49 strikeouts in 47 2/3 innings. Over has last four starts, he has surrendered one run on 11 hits while striking out 27 batters and walking seven in 27 1/3 frames. His changeup, over this small sample, has been an impressive go-to out pitch, with a whiff per swing rate of 36.4%. Having said that, Fulmer has never thrown more than 124 2/3 innings in a season. Even if Fulmer’s capable of throwing 150 or more innings this season, which he very well could be, what are the odds that the Tigers will let him get there, especially if they fall out of the race in the AL? There’s also the very real chance that he pitches well the rest of the season, but this is still his peak. Three straight scoreless outings is always a good time to try to sell a non-elite-prospect rookie pitcher. Is it possible that Rougned Odor’s punch heard around the majors was one of the three best things that happened to the Rangers this season? Odor’s suspension led to the Rangers promoting former top prospect and full-on post-hyper Profar for what appeared to be a one-week stint with the club. Instead, he has hit .380 (19 for 50) with two homers, two doubles, two triples and 12 runs in 11 games. He has hit leadoff in all 11 of his games, though it’s worth noting he has seven strikeouts against one walk. What’s more, with Odor back in the lineup, Profar got his first start at first base on Tuesday. If he proves himself a capable first baseman, he could play nearly every day, getting time spelling Odor, Elvis Andrus and Adrian Beltre, and likely a few starts at DH, as well. Profar is here to stay, and he’s going to be a key player in fantasy leagues for the rest of the season. • JAFFE: After latest incident, is Yordano Ventura’s act wearing thin? It’s time for our monthly appreciation of Pomeranz in some way, shape or form here at SI.com. This time it’s the Buy, Sell or Hold Committee recognizing his achievements this season. The former failed-prospect-turned-solid-reliever is headed for his first All-Star Game this July. Let’s just run down some of the company he’s keeping this season, which should dissuade you from engaging in what you think are sell-high talks. Pomeranz is 20th in the majors in ERA, 14th in FIP and tied for 20th in fWAR. He’s one of seven pitchers with a strikeout rate of 29% or better. The others are Jose Fernandez, Clayton Kershaw, Noah Syndergaard, Stephen Strasburg, Max Scherzer and Danny Salazar. Petco’s always going to play to his advantage, not that he has needed it much this year. Remember, no one is untouchable. If someone bowls you over with a deal for Pomeranz, take it. Understand, however, that he is not bound to come down from these heights any time soon.